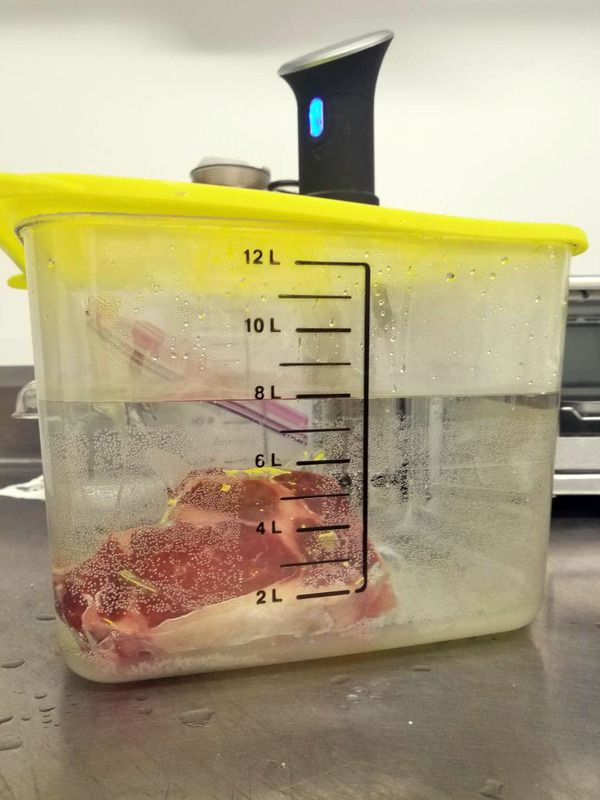 Prepare a water bath deep enough to contain the heating element of the ANOVA sous vide, but don't fill to the top so as to leave room for your steak. 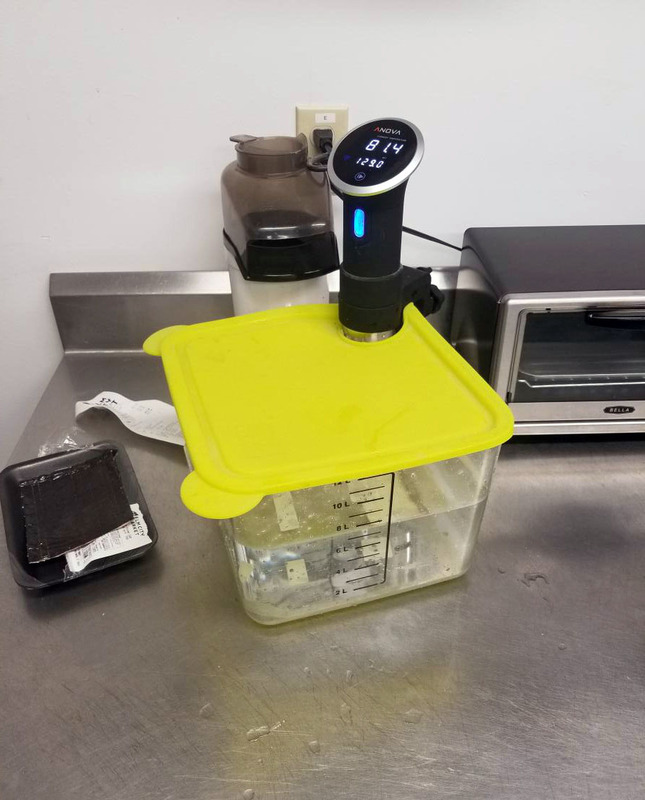 The ANOVA can be set to a time and temperature easily using the phone application and a Bluetooth connection, or you can set it manually with the blue knob visible in the picture. For the ribeye steak in this example I used ANOVA's suggested time and temperature, 1 hour at 129 degrees. The steak can go into the water bath either in a vacuum sealed bag or in a ziplock. MakeHaven doesn't have a vacuum sealer, so we can use a ziplock. The key is to get the air out of the bag using immersion in water. Salt and pepper your steak to taste. Place it in the ziplock bag and get as much air out as you can. Seal the bag 90%, and slowly add it to a bowl of water. The water should push the remaining air out of the bag--once it has, seal the last 10% of the ziplock closure. 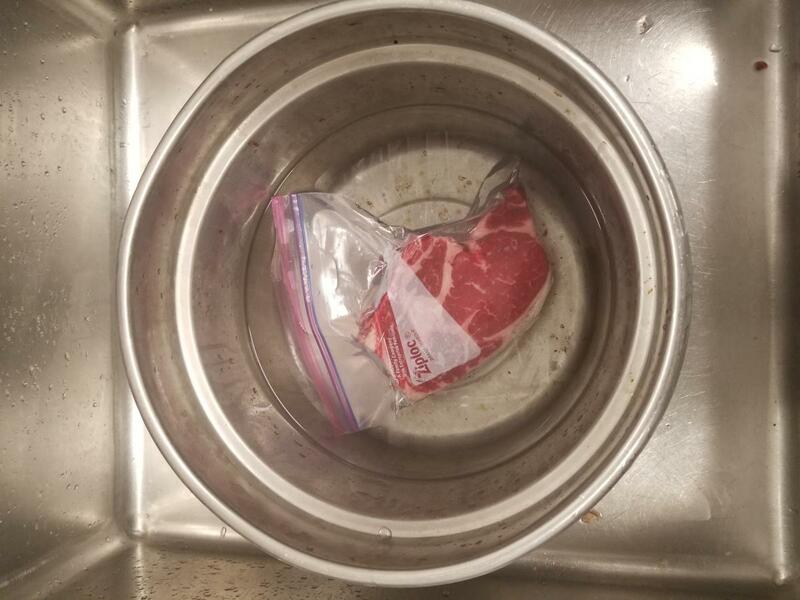 Once your water bath is up to the correct temperature, (carefully, using tongs) place the ziplock bag with your steak into the sous vide bath. Start the timer and wait. After your steak has cooked in the sous vide bath, it is safe to eat. However, this finishing step will give a little more flavor and texture to your finished steak. Put a small amount of oil with a high smoke point (i.e. not butter or other low heat oil) into a frying pan and put the burner to high. Remove your steak from the ziplock (again using tongs) and pat dry with paper towels. 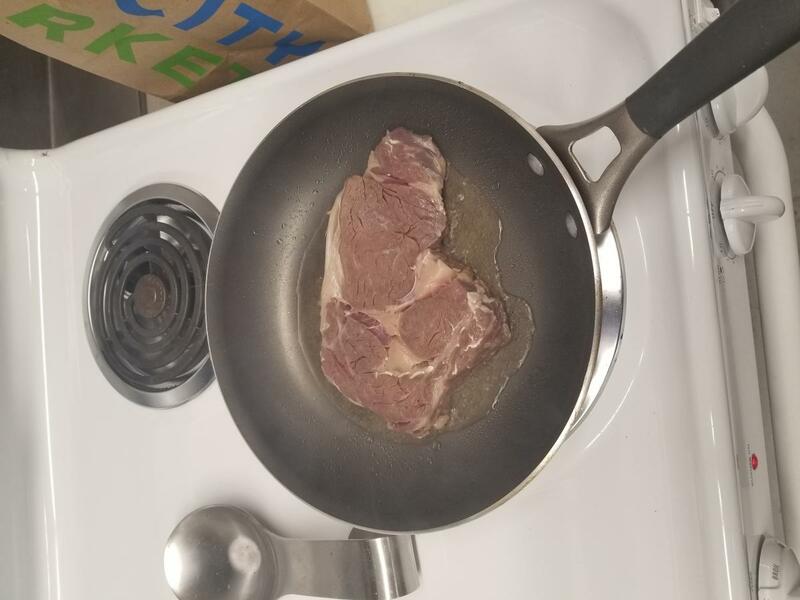 Once the oil has begun to smoke, place your steak in the frying pan. 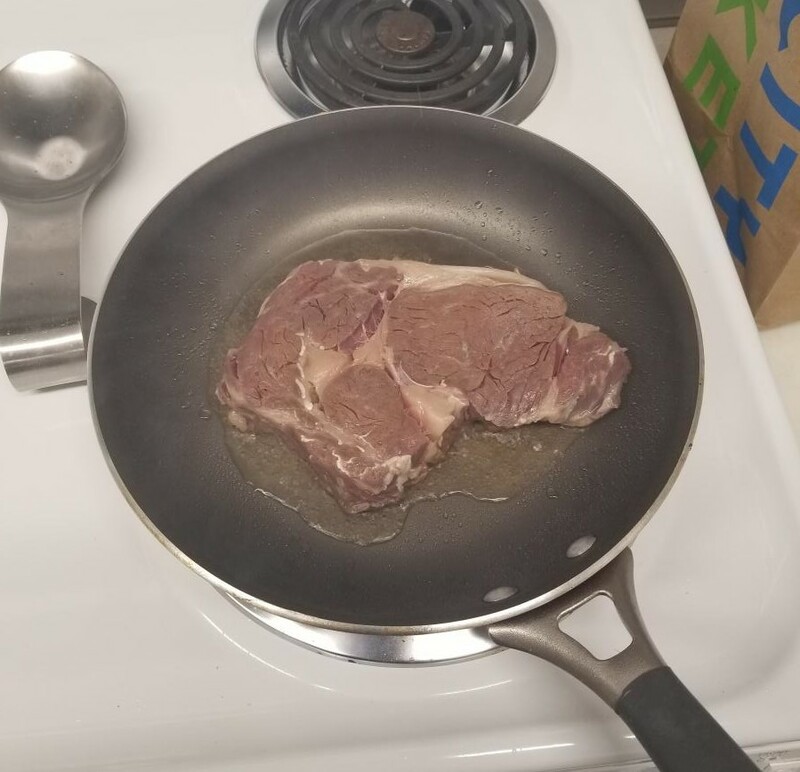 You only need to cook approximately 30 seconds on each side--you don't want to cook your steak any further, just add browning to the outside. Your sous vide steak is now ready to consume. You don't have to 'rest' the steak like you would with a traditional cooking method, the temperature should already be uniform from the water bath. A thicker steak shows off the power of the sous vide to fully cook the inside without drying out the outside of the steak.